The Planetary Radar Group is Group F in Section 332, the Communications Architectures and Research Section. 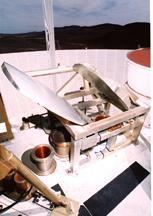 We provide the advanced engineering and we direct the development of the technology needed to sustain and enhance the unique Goldstone Solar System Radar. We are the interface between scientific research goals using the Radar and the engineering technology to accomplish these goals. The Radar is part of the Deep Space Network (DSN) and is located at Goldstone in the Mojave Desert some 180 miles north-east of Los Angeles. It is sponsored by the Interplanetary Network Directorate (IND). 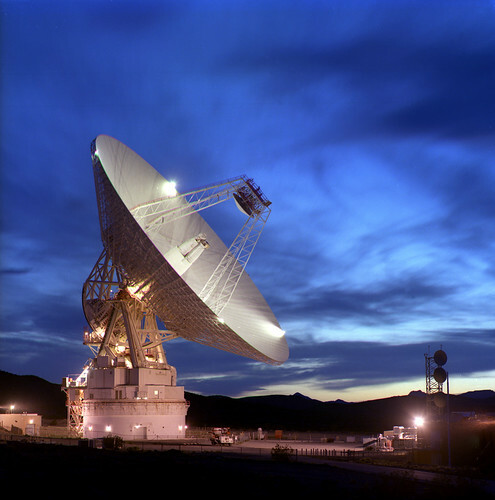 It operates from the 70 meter antenna DSS-14 at the Mars site at Goldstone. 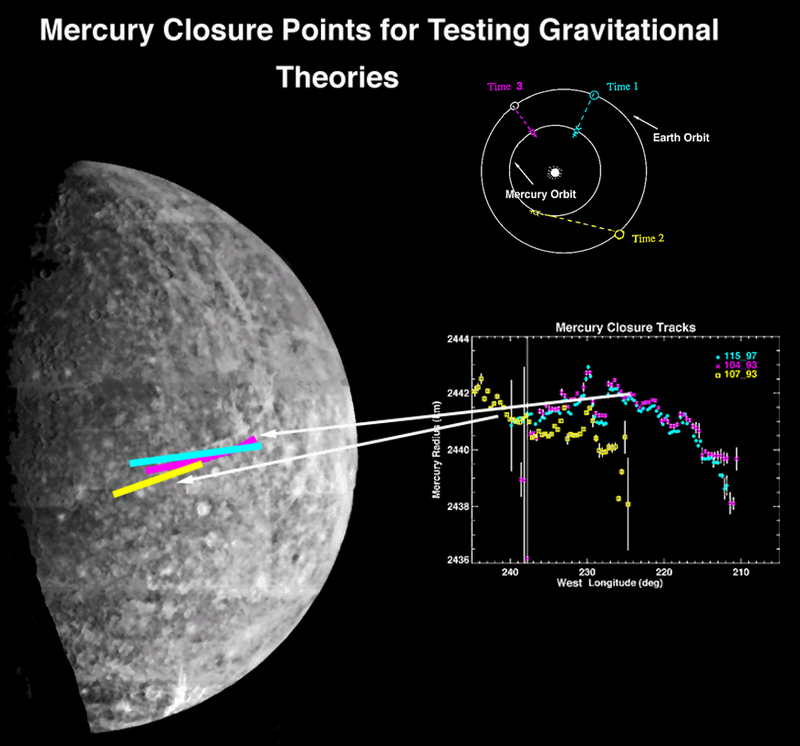 We use the Radar for investigations in planetary astronomy. The principles of Radar operation generally require that we transmit as much power as we can, and the receiver system is as sensitive as we can make it to register the usually faint echo power reflected from the target. We have a powerful Transmitter on the 70 meter antenna developing 500 kW at X-Band (8560 MHz, wavelength 3.5 cm). We have cryogenically cooled HEMT Low Noise Amplifiers as the first stage of the Receiver. In order to confirm that the experiment is proceeding successsfully, we operate with a real-time Data Acquisition System which performs preliminary processing and displays the currently received echo power. 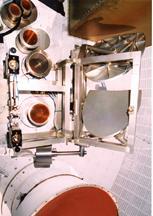 The GSSR Receiving System, the journey from mere echo numbers to Radar science image. Low Noise Amplifiers The very sensitive first stage of the receiving chain; scratching the echo from oblivion. 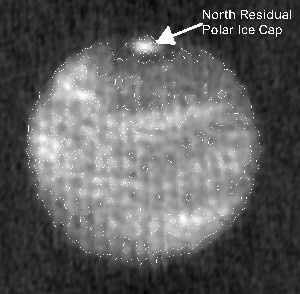 The Radar can observe any accessible Solar System target. We can obtain echoes from Mercury, Venus, Mars, the satellites of Jupiter and Saturn, the Moon, and asteroids and comets. 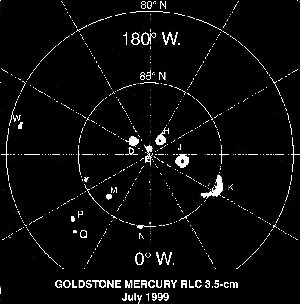 The remaining outer planets, Uranus, Neptune, and Pluto, are too distant to produce a detectable echo at Goldstone with the current equipment. Near-Earth asteroids, in particular, such as Toutatis and Geographos are prime targets. These are increasingly prominent in scientific interest and concern. Specifically for these we have developed the Single Horn System. This allows fast switching of the radar high power radar for targets which pass close to the Earth. We use the Radar to investigate the statistics of Orbital Debris. This is material in low-Earth orbit resulting from spacecraft activities and the break-up of satellites and rocket parts. Knowledge about this is crucially important for design of shielding for Space Station modules. The Radar is capable of sensing rice-grained sized particles, which form a large part of the debris. Most observations take place exclusively at Goldstone, usually at DSS-14 alone, sometimes with DSS-13, the 34-m antenna, as a second receiving site. Other 34-m antennas will be used as they come on-line. Occasionally we have joint observations with other observing sites; e.g. we also receive radar echoes at the NRAO Very Large Array in the New Mexico desert. We have an active scientific and engineering collaboration with the NAIC Arecibo in Puerto Rico. The advantages of sharing common radar data formats and data reduction software with the Arecibo Observatory are obvious. In principle anyone with SMD peer-reviewed planetary science funds may propose an experiment which needs the Radar. There is a User's Guide which advises nomenclature, describes the various Radar observing configurations, and details the other requirements necessary for an observation run or radar track. The engineering direction of the Radar develops principally from the scientific requirements established by the Space and Earth Science Programs Directorate (SESPD). We formulate implementation efforts within JPL Division 33, working very closely with IPN 9200 Office DSN Data Systems which has overall responsibility for DSN Implementation Engineering. 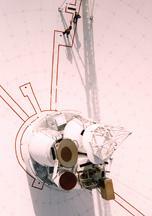 Many of the features in the Radar are unique in the DSN and also in the world. The successful operation of the world's most powerful X-Band continuous wave (CW) transmitters in particular requires dedicated and extensive expertise. The GSSR still aims to develop and integrate new technologies such as the all-digital JPL Block V Receiver, to improve the science return and operational reliability. It is our purpose to increase productivity of antenna use, to get more and better images per transmitted photon per transmitter second.